Russia and Serbia signed the contract to supply two Mi-17V-5 helicopters to Belgrade in September 2015. Russian Helicopters holding has delivered two Mi-17V-5 (NATO reporting name: Hip-H) medium military-transport helicopters to Serbia, according to the company`s press department. "Both Mi-17V-5 rotor-wing aircraft for Serbia were produced by Kazan Helicopter Plant (Russian acronym: KVZ, a subsidiary of Russian Helicopters). Russia and Serbia signed the contract to supply two Mi-17V-5 helicopters to Belgrade in September 2015. The agreement has been implemented within time limits specified by the sides. It included the delivery of two helicopters and the training of Serbian pilots and technical staff. Four pilots, two panel operators and seven technicians were taught how to operate and maintain Mi-17V-5 helicopters at the KVZ`s Aircraft Training Center", a Russian Helicopters` official spokeperson said. Serbian` Prime Minister, Aleksandar Vu·i· pointed out that prior to the recent delivery Serbian Armed Forces had not received new rotor-wing aircraft for 36 years. He added that Belgrade spent 25 million euro ($27.5 million) to acquire the aforementioned Mi-17V-5 helicopters. The commander of Serbia`s Air Forces, General Mayor Ranko Zhivak added that Serbian Armed Forces are being rearmed with new military equipment. "When the required technical checks and acceptance measures have been finished, both helicopters will be issued to the national army", Zhivak pointed out. 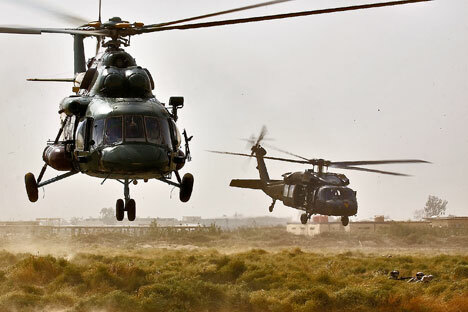 According to the Military Balance 2016 report issued by the International Institute for Strategic Studies (IISS), the rotor-wing aircraft fleet of Serbian Armed Forces comprises 2 Mi-24 (Hind), 1 Mi-17 (Hip-H), 49 SA341H/SA341L Gazelle, and 8 Mi-8T (Hip) helicopters.